Vin rouge - AOC - Cépages : Syrah, Cabernet Sauvignon et Mourvedre. Le Villa Minna Vineyard a une bouche pleine et velouté, la fraicheur est bien présente et les fruits rouges se rapprochent de la groseille et de la framboise tandis que la finale est plutot réglissée. Villa Minna Vineyard Red wine must be aerated 10 minutes before serving at 18°c with guinea fowl, yound pigeon or boar stew. 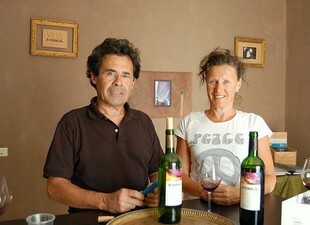 Wines of Villa Minna Vineyard are developed by love of the wine. They are powerful, greedy, full of freshness and a big aromatic complexity. They are sold 5 years after the grape harvests for red wines and 3 years for white wines. It is in 1929, that the grandfather Alexandre acquires the family property. Placed in Aix-en-Provence and Salon de Provence, 15 ha of the vineyard come on two hillsides. In 1999, after the resumption by Minna, their first vintage wine go out. And in 2005, the first white wine Minna Vineyard is born, amount to the red wine. In 1987 Jean-Paul and his wife Minna took over the family domaine by starting to remove old vines and replant new vines. In the following years, they has improved their vintages respecting their products and they finally got 2 stars in Hachette famous guide.